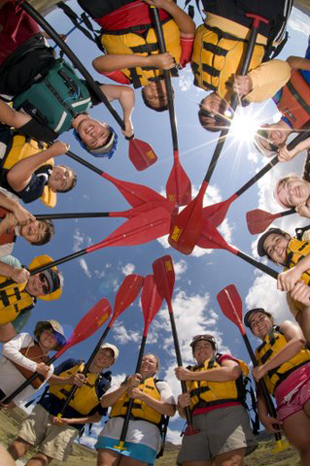 Working with ROW Adventures, River Dance Lodge is able to offer some of the best outdoor family adventures and family rafting trips. A family vacation in Idaho means high quality, uninterrupted time together. When you arrive, turn off the cell phones - they don't work here anyway - leave behind the laptop, and focus on life with your loved ones. The nearby river calms the soul and inspires the spirit, strengthening bonds and deepening relationships. It's what we call "Family Magic." The River Dance Lodge, a great Idaho family reunion destination, is fully equipped and ready for your next Family Reunion. With eight cabins that accommodate between four and ten guests, we have the capacity for groups as large as 70. We also have camping sites for even larger family reunions. Call and schedule in advance and you can make the River Dance Lodge one big "family reunion rental". Teaming up with ROW Adventures, the River Dance Lodge will provide your family reunion in Idaho with numerous choices of nearby activities like: Lochsa whitewater rafting, kayaking or floating on the Clearwater, guided fly fishing, horseback riding, or hiking and biking in the Selway-Bitterroot Wilderness. Just pick the activities you would like to do and we'll make all of the arrangements. One of the biggest worries with family reunions is "food". Who is going to bring it? How are we going to make it? 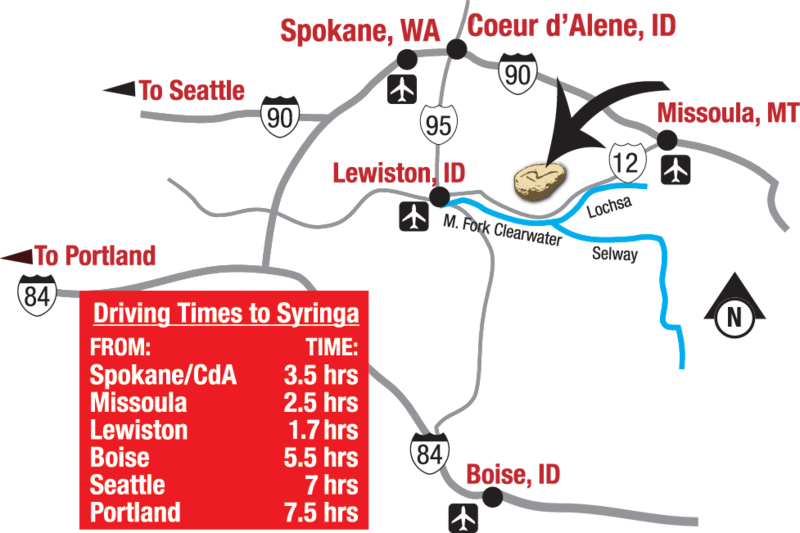 The River Dance Lodge's on-site Syringa Café serves delicious cuisine and is also available to cater custom meals for your reunion. Would you like to cook some meals yourself, or have a family reunion cook-off? No problem! Each of our cabins have convenience kitchens inside with microwave, coffeemaker, dishes and under-counter refrigerator and a charcoal grill outside. We'll even provide you with the charcoal. Our cabins and glamping tents sit in front of the Clearwater River, which makes it great for guests to grab one of our kayaks or fishing poles and have some alone time with nature. One of the best activities for kids is swimming. 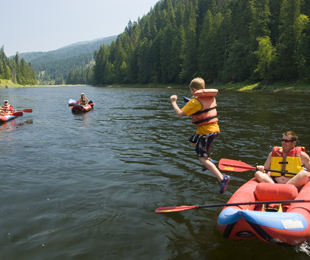 The Clearwater River and the local sandy beach both provide a great play ground for kids. Tell them to grab their swimsuits and take a dip! After the end of each day after the kids are snug in bed, you too can take a dip in your private hot tub or sit out on your cabin's porch while relaxing to the sounds of nature and reminiscing with relatives. "Make an effort to keep in touch afterwards; create a family website that everyone from the reunion can visit." "Police Lineup"- Here’s a good way to make people talk. Gather them all together and say, "Okay, line up by your height." This is just a warm-up. After that, have them line up according to birthdays. Then shoe size. Then the age at which they were potty-trained. They’ll have to talk there, that’s for sure. Need some more sample line-up questions? Here you go. "Capture the Flag"- The old favorite, chock-full of wheezing, gasping old men and giggling flag-guards who have done absolutely nothing. Equipment Needed – A very large area in which to play, two rags that serve as flags, and a middle boundary. How to Play – You break into two teams and set the sides. Both teams hide their flag. Then you break and go across the center, trying to steal the other team’s flag and make it back to your home area without getting tagged. If you get tagged, you’re caught and go to the other team’s prison. The only way to get out of prison is for someone on your team (who isn't also in prison) to touch you in jail. Then you can run free (be careful, you can get recaptured if you get tagged on the opponent's side of the field again). First team to get the other’s flag and bring it across the boundary line wins. A River Dance Lodge family reunion friendly warning – this game can be hazardous to your health. Don’t run around any more than you can handle. If necessary, slump down in the dirt and play dead until you can breathe again. How to Play – Give people or groups a list of things to hunt for, and the first one done wins. The common version is to have everyone find strange things (tennis ball, piece of string, coconut...) and bring them back. Cleanup hunt - This version is especially good near the end of the reunion. Give everyone a list of different types of trash (Dr. Pepper can, napkin, plastic fork, watermelon rind, etc), or just see who can pick up the most pieces of trash. Family hunt - Give them a list of personal characteristics, and have them find family members who match (for example, green eyes, no hair, same color eyes, born the same year). We suggest tossing in a couple of easy ones like same number of arms, born after 1950, etc. "Tug-a-War"- Possibly the greatest family reunion game ever! Equipment Needed – Strong, thick rope (not nylon, which can stretch and break). How to Play – Divide the group into two teams (try to make them even by total size, not necessarily by numbers). On the mark, each team tries to pull the other across a line – a small creek, mud hole, or the stream of water created by a hose. Variation – One branch of the family against the other, male against female, etc. The River Dance Lodge in Idaho has plenty of ideas for planning, games, activities and more. Please give us a call with any questions or request our lodge for your next family reunion.